I’ve spent much of the day writing the first of a three part series on the Baptist General Conference’s response to the Vietnam War. Before the first part of that series debuts on the blog sometime this weekend, I wanted to pause and reflect on something Chris and I noticed at the outset of this project. While researching Bethel history has its own pitfalls, a distinct lack of sources is not one of them. We’re lucky to have the archival repository of both the Baptist General Conference and the university located on campus, a collection curated by the history department’s very own Diana Magnuson. And since the establishment of the Bethel University Digital Library in 2009, its current director, Kent Gerber, has overseen the digitization of many of the most important holdings of the archive. Indeed, Bethel’s digital library is currently the largest of all of the Twin Cities’ private colleges. All of which means we have a plethora of primary sources available to us – at best online, at worst a ten minute walk away. We’re also the inheritors of several generations of Bethel historiography. Beginning mid-century, Bethel history professors Adolf and Virgil Olson (Virgil is Adolf’s son) contributed a pair of substantial monographs on the Baptist General Conference and Bethel. 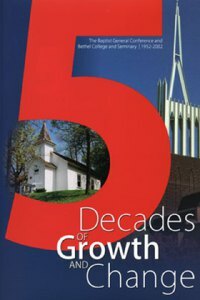 Those books were followed in 1961 by an edited volume documenting the years from 1956 to 1960, and more recently by a 1997 booklet authored by one current and one recently-retired Bethel history department members, Diana Magnuson and G. William Carlson. The latest effort is a massive tome edited by James and Carole Spickelmier, published in 2010. That work features a chapter by Drs. Magnuson and Carlson which extends their previous treatment of the college into the twenty-first century. Despite these substantial works on Bethel’s history, Chris and I noticed right at the beginning of our project that only one of the five mentions any of our four wars – the two World Wars, Vietnam, and the War on Terror – beyond a perfunctory phrase or sentence. This is partly explained by the timing of these monographs – Adolf and Virgil Olson, writing in 1946, had little distance from which to reflect on WWII. However, by the time Adolf published his next book in 1952, one would think sufficient time had passed to offer even a passing reflection on the importance of the war as a driver of institutional change. And at any rate, neither the 1946 or the 1952 book reflects on the first World War. After WWII, with the return of a large number of veterans and the emergence of the senior college with its effort to attract a larger student body, the ethnic identity began to merge with the larger evangelical movement. Even the Swedish language course requirements, along with a commitment to a Scandinavian heritage were curtailed in the curriculum. They were replaced by broad liberal arts curriculum informed [by] a conservative, pluralistic, evangelical theology (page 10). While Chris and I have no designs on writing a comprehensive history of Bethel’s engagement with modern warfare (our proposal described the project as an “impressionistic survey”), we hope to fill this important gap in Bethel’s historiography. Twentieth-century war had society-wide effects, and its role as a catalytic driver of change at Bethel has not been recognized adequately. That being said, and while I don’t pretend any of these are terribly profound insights, I’d like to suggest three theories as to why this gap exists. Doing so can be tricky. It’s one thing to offer critical comments on works by people long-dead, it’s quite another to do the same as a student at a school where some of my subjects are very much alive and well. This approach characterizes – to varying degrees – most of the works discussed here. Certainly the oldest are most prone to tidy narratives of providential success, but even the more recent works occasionally stray into commemoration. In reading each history in turn, one gets accustomed to the proper sequence of events, the cast of characters who make their obligatory appearances at the correct moment. Bethel’s history becomes something of a liturgy, where omissions or insertions of important fact interrupt the rhythm of the story. Of course, commemoration is hardly bad or wrong, but it is a different kind of history, produced for a different purpose, than what Chris and I seek to accomplish here. Second and related, there is a tendency to focus more on the personalities of Bethel than on trends across higher education generally. College presidents, provosts, and deans are both highly visible agents of institutional change and easier to research – the History Center archives hold the papers of the last seventy-odd decades of Bethel presidents for example. With the limited research and writing time afforded most institutional histories, focusing on notable personalities is an effective strategy. Which brings me to my final suggestion for the lack of war-related reflection in Bethel’s historiography. As Chris mused on Pietist Schoolman, writers of institutional histories are usually drawn from the ranks of the school’s own history department where “many of these historians do not specialize in the history of education itself, nor do they have the time and inclination to develop such expertise on top of conducting a research project that is likely, to some degree, a distraction from pressing concerns in their actual fields.” The result is that institutional research is largely ‘siloed’ – conducted in “relative isolation from similar works done about similar institutions, and from the larger body of research on higher education in America.” In such a context, it is difficult to generalize trends across schools – an approach something as big as a modern war requires.